This is life, the one you get, so go and have a ball, because the world doesn't move to the beat of just one drum, what might be right for you, may not be right for some, you take the good, you take the bad, you take them both and there you have, my opening statement. Sit Ubu sit. Good Dog. I got bored with the old profile. I like music, how about you? Pop in now and then. Leave a post once in a while. 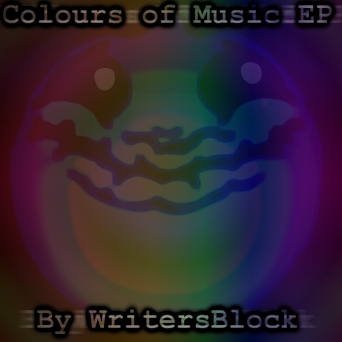 So, yeah, "Colours of Music EP" is just a short project slapped together while I've got the proper Colours of Music project on hold. Obviously, it's nothing I'd think about selling, it's a showcase of my music, is all, and I think it's a huge step up from 2007, and I was hoping to upload the latest track "Astronaut's Waltz" here today, but upload issues say it's not a valid .mp3, which it is, and I've tried changing the title, importing and exporting in audacity, it's a 128 kbps .mp3 sampled at 44.1 kHz as exported in FL7. I don't know why it fails me, it worked fine uploading to newgrounds, so if anyone actually comes to this blog and wants to listen to my latest music, you'll have to go to newgrounds, and I'd much prefer to have everything right here on bandAmp for your convenience. I might also try uploading the EP to LastFM (I went there a while ago to find out that I already had an artist profile, I was flattered!). And now for a shameless plug for his site, it's basically a site where he can showcase all his epic orchestral compositions/collaborations, provide news and take requests for games/movies. He's got a real professional sound, and there's lots of songs to just spend hours listening through, it's well worth the listen. So, yeah, that's what's up with me, I've kind of drifted in and out, not really contributing much here, but I've got stuff ready to contribute when I can get things sorted out. Things that have been happening lately. Everything in fruity loops studio is working for me fine (for now), which is always handy. Still having a lack of audio, but I'm working around that. 6 of my tracks that I've got on newgrounds, 3 of which I've got up here, have been used in a sprite movie, and it's the first of a series of 5, and I'll be doing more music for these guys, some covers, some originals. Also, after my exploration of Drum and Bass, I feel that I can start to progress with my plan for an album: The Colour of Music. I had a few tracks set for that, but I'm feeling that I should really do this thing properly and redo some decent old tracks, polish them up and make them album worthy. I've got a polished up "Snowboard Kids: Hidden Track" that I'll probably put on the album, but I'll probably go back to the original name I had associated with that tune: Winter Division. I think the next song I'll make will be a mixture of orchestral drum and bass. There's an artist on newgrounds who's done some brilliant stuff in that style, and now I'm dying to give it a crack. But this is probably something I'll spend a decent amount of time on. My last track, I've spent about a week working on, and it was a remake of a song I had done before, whereas before that, I've never spent more than a couple of days on a digital song. I've got a feeling that my music will sound a lot more professional from now on, with an experiment here and there, not sounding too bad, but the days when I cranked out sound in 30 mins -a couple of hours are gone, I feel that I need more time to do my music justice. I've figured that it's time to give back to you guys some higher quality stuff, after you've helped me find my musical self over the past year. 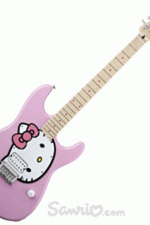 Like the picture of the hello kitty guitar? Sure, you do. If it came in a left handed bass model, I would so buy it. Providing I had the money to buy it. You may (or may not have seen) that I have a new song out, it is called "Snowboard Kids: Hidden Track"
It's what I would imagine a bonus SBK song would sound like if it were 8-bit. I did it like that for a competition, and also because I can just use 8-bit presets, and I don't have to tweak it, because at the moment, no audio is coming through my computer speakers. No idea why. But I got the track finished (I may tweak the volumes a bit, give a bit more atmosphere, because panning and reverb would extend beyond the realms of chiptune-ism. So my non existent sound is what I blame when I don't review your music even though I am on here. I can download the songs, so I'll do that now and then until my problem is solved. But I can do lyrics fine, so I might do a bit of lyrics review now and again. Speaking of lyrics... I have a new lyric up, it's Christmassy in a propaganda type of way. You see, it's about how people are selfish over the holidays and how this highlights how we don't really attempt to achieve any major goals and resolve worldly issues, such as global warming, we just put it off for another year. So it's quite a serious song, and it sounds really sweet with the acoustic guitar progression. I'm proud of how it turned out, and if I can snag myself a mic over Christmas, I'd like to try and record it, because it's the first real instrument and lyrics song I've done in ages. So, that's what's up with me, all music, no job and my parents still wanting me to pay off their car so then I can call it my car. Fun. Ok, what's new with me? Well, since I've been gone, I've succesfully passed high school, and now I've got exams to get into uni. I've obtained a drivers license, and I've aged a little bit. I've developed my music skills a lot since I was last here, I'm still using FL7, and I'm focusing on electronic, rather than writing lyrics etc. I have now got an amp for my guitar, and it''s sounding pretty good, but I'm not going to try writing music for it until I get a mic (maybe next year?). I've mostly been putting music on newgrounds, hoping my music will get used in movies and games, and while 5 of my songs have been used, and I've been named as the composer for a project in the works, the community there is a lot more hostile to musicians. I'm hoping to pick up where I left on bandamp, while still keeping my stuff on newgrounds, as I've noticed more attention coming to my songs as quality improves. I've got a few pretty decent tracks that I've accumulated over the months, so I'll put them up, and get things going from there. Hey, it's been a while since I've been on BandAMP, so I just thought I'd drop in and submit something. I've been messing about a lot with Drum 'n Bass lately, and this is one of the better outcomes. I'd like to build on this and make it one real long diverse song, but I'm stuck on inspiration at the moment, so this is how it is for the moment. This is a fun little piano song that I wrote for a competition with the theme"Dad'n'Me", which is a game about a buff purple dude and his kid beating up little kids (fun!). It's full of cheek, so I think the song captured the style pretty well. First of all, the piano VSTi I used is poor, it's all over the place. I aimed to incorporate tempo changes and a bit of jazz inspired accidentals, and I'm happy with it so far, but it's unfinished. The fast part is too fast, and the patterns don't change with the tempos (I'll fix that), I've also got to add a second slow section and a med-fast proper ending. Here it is for now. Much love to you all. Hope you get lots of chocolates and roses and love today. I've been fairly quiet on the amp lately, but I come in fairly frequently, to see how things are going. So, sorry, guys, for being so quiet. It's about war and peace and love and cute little blimps. Anyway, have a good one, guys. Much love. Witchwyzwurd's "spin the ball (ver 3)" with some drums added. They're pretty ameteur-ish, a little bit of issues (there's one crash in there that's too loud, among other things). So if you like drums with this song, then you could suggest how I could improve them. This is the first time I've added something to a pre-existing song, so I hope it's ok. Cool. Thanks! I didn't know about the looping in edison, that should make things a lot more flexible.